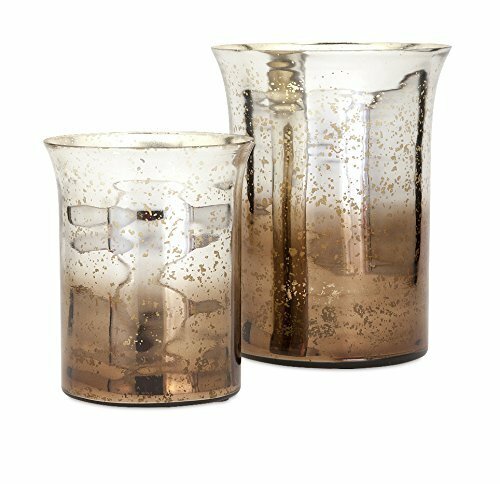 Benet Small hombre hurricane--these simple candle lanterns have a gorgeous, glowing look, even when the candle within isn't lit! handcrafted of mercury glass, they feature an inspired hombre color scheme and look best when displayed in Multiples. A simple aluminum base adds strength. The finishing touch simply fill with your favorite scented or unscented pillar! available in two sizes, the Small as pictured here measures nine inches high with a seven 1/2 inch diameter. Please be aware that as they are entirely handmade, there may be slight variations in size, finish, color and texture. These variations are a reflection of the authenticity of the piece and signal the originality of the artisan. Care instructions: dust with a clean dry cloth. Brought to you by IMAX- one source, a world of choices.